Pet grooming in Des Moines by Denise's Doggie Do's Mobile Pet Grooming has never been easier. 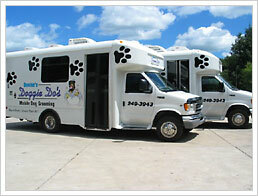 Denise's Doggie Do's Mobile Pet Grooming has two state-of-the-art mobile pet grooming salons. Whether it is a toenail trim and grind, bath and/or haircut, Denise's Doggie Do's Mobile Pet Grooming in Des Moines does it all. All of our mobile pet grooming services are done in the convenience of your home on your time. You can come to the door in your bathrobe, sweats - whatever! We don't care; we just want your precious pet to groom. You don't even need to be at home, we can come in and get your pet for their grooming and when you return you will have a well groomed pet waiting anxiously to show off their new cut! Don't forget - we can come to your office or other location too. We know you have a choice when it comes to pet grooming in Des Moines and we appreciate you choosing Denise's Doggie Do's Mobile Pet Grooming for your entire pet grooming needs. Whether you need mobile dog grooming in Iowa, or services for your cat, we're confident we will be your number one choice for mobile pet grooming in Des Moines. When Denise's Doggie Do's Mobile Pet Grooming pulls into your driveway you can relax as your pet will no longer have to deal with these uncomfortable things that they normally have to at other shops. Call 515-289-4469 to book an appointment or email me at: contact@iowamobilepetgrooming.com. 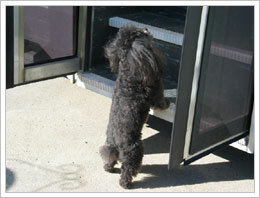 Denise's Doggie Do's wants to be your choice for dog grooming in Des Moines!